Everything about Freddie Mercury was different. A unique man who was born to entertain he had a restless artistic spirit. 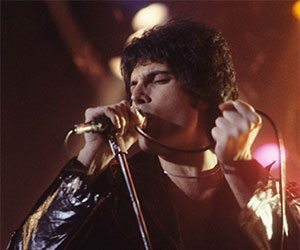 His work with the legendary Queen was as part of a collective but Mercury’s unpredictable edge befitted his stage surname and gave them a flamboyant frontman who relished the spotlight and chewed up the scenery with relish. But there was art beyond the artifice. A technically brilliant pianist and a mesmerising vocalist with huge range he was responsible for the classics “Bohemian Rhapsody”, the thrilling “Killer Queen“, the baroque “Don’t Stop Me Now, the rocking “Crazy Little Thing Called Love” and golden anthem “We Are the Champions”, amongst so many. His posthumous elevation to the Rock and Roll Hall of Fame, his Brit Award for Outstanding Contribution to British Music and the tribute concert held in his honour at Wembley Stadium – where else? – lent him peer and industry recognition. Classic Rock would vote him at the very top of their best rock singers of all time in 2009. Plaudits and pageantry aside Mercury had his demons. He was an idiosyncratic man but he also had a close-knit circle of friends. He would have been a star in any era; we’re lucky it was ours. 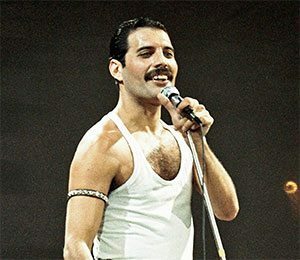 As a solo artist beyond Queen he released two highly regarded solo discs: the tongue-in-cheek but accurately titled Mr. Bad Guy and the full-blown Barcelona. Both appeared in the mid-1980’s. He was just as pleased with his faithful cover of The Platters “The Great Pretender”, giving the song an interpretation that made it feel like he owned the lyric. There was startling work with David Bowie and Queen on “Under Pressure”, liaisons with Ian Hunter, Billy Squier, Roger Taylor’s project The Cross, Michael Jackson/The Jacksons and Mick Jagger. Bowie said of him “Of all the more theatrical rock performers, Freddie took it further than the rest… he took it over the edge.” Fred saw the band, and presumably himself as “the Cecil B. DeMille of rock.” He and they were certainly a grand touring proposition who broke box office records from Latin America and Hungary to Knebworth but most reckon that the Live Aid show topped everything in 1985 when Mr. Bad Guy raised the roof of the old Wembley Stadium and it hasn’t been seen since. Born Farrokh Bulsara in the former Sultanate of Zanzibar (aka Tanzania) the man who later took the stage name Freddie Mercury studied in his homeland, in India and eventually London where he attended the Ealing Art College, studying graphic design (he was responsible for the band logo) but just as significant was his stint selling clothes in Kensington Market with girlfriend Mary Austin. People flocked to their stall just as keen to chat as to try on the clobber. And there was also music, lots of it. Fred had roles in the group Ibex, who became Wreckage. He also sang for heavy blues-rock band Sour Milk Sea (named after a George Harrison song) and eventually pitched up in the experimental Smile who became – dah dah – Queen whose own name was both regal and deliberately arch. Now their history is well covered elsewhere in our pages and we urge you to explore the Album-by-Album entry for further elucidation. 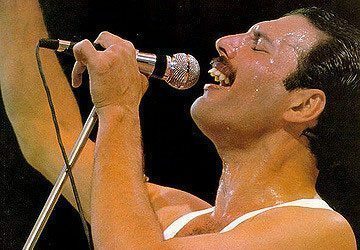 Now Mercury gave his all to that cause and even when stricken with sickness in later years his presence galvanized the songs with a tenor and baritone profundity and a swooping four octave range. Never keen to loiter in the same old territory his songwriting style was ambitious and audacious as could be heard in the early masterpieces “Seven Seas of Rhye” and “Killer Queen” or appreciated more reflectively in “Play the Game” and the pretty ballads he brought to the table. His own tastes were eclectic, ranging from the classical masters to the rock era of The Beatles, The Who, Jimi Hendrix, Led Zeppelin and kindred spirit David Bowie though his own keyboards prowess shouldn’t be underestimated. He didn’t shy away from synthesizers but still loved the concert Grand and the harpsichord whose textures gave Queen and his own work a romantic slant. In 1985, with Queen on sabbatical, Mercury recorded and released Mr. Bad Guy with producer Mack in the familiar environs of Musicland Studios, Munich. Dedicated to his own cats and cat lovers across the universe this album hit the top ten in the United Kingdom but was strangely overlooked at the time in the United States. Ripe for (re) discovery the highlights include the autobiographical lament “Living On My Own” and the more upbeat “Made in Heaven” as well as the dance/disco gem “I Was Born to Love You” that tipped a nod towards the general direction of Giorgio Moroder. Working with a core group of players whose numbers included Reinhold Mack, multi-instrumentalist Fred Mandel, German drummer Curt Cress and guitarists Jo Burt, Stephan Wissnet and Paul Vincent, Mercury was in his element. Away from helming Queen he devoured his love for disco and the newly minted 12″ dance remix medium. By contrast the deep groove of the title track with a big-band horn arrangement and the Latin flavoured “Your Kind of Lover” added depth. On “Man Made Paradise” (check that double-edged sword in that title) elements of the Queen sound came rushing in. Check out the UK CD for bonus track mixes. Everything here bears his stamp. He was totally hands-on in each aspect of recording and was quietly thrilled by the results. Three years later Mercury stunned the music world with the classical operatic crossover of Barcelona (1988) whose title piece spearheaded the forthcoming Olympic Games in that city and featured the extraordinary talents of Montserrat Caballé. He died a few days before the opening ceremony. Nevertheless, as with “We Are the Champions” this song became a spiritual and sporting anthem. Even more varied than its predecessor, Barcelona contains the intriguing “La Japonaise” (the main disc peaked at #1 in Japan on reissue) and the ecstatic “The Fallen Priest” where keyboardist Mike Moran added his parts and magnificent orchestration/arrangement. Caballé and Freddie get it together on Ensueño (originally “Exercises in Free Love”) and “The Golden Boy” where Montserrat’s Catalan operatic soprano adds perfect counterpoint to an underrated career highlight. The all-star choral cast features Madeline Bell, Lance Ellington, Miriam Stockley’s vocalese and old songwriting friend, Jamaican-born singer and actor Peter Straker. “How Can I Go On” also thrilled fans of Queen since bassist John Deacon added his usual brilliance. The poignant “Guide Me Home”, that may have been the last finished number, retains a special significance. For maximum pleasure simply gravitate towards the 2012 3-CD and 1-DVD Special Edition. Here you’ll find a fully symphonic remake of the original album (as transcribed by Stuart Morley of We Will Rock You, the musical fame), a Best of Rarities and Session Outtakes – many alternative versions and a peachy demo of “Rachmaninov’s Revenge (The Fallen Priest)”. An instrumental treatment of the album and nightclub footage from Ibiza and Barcelona wrap this up. Altogether this is a sumptuous package whose roots in the clear air of Mountain Studios, Montreux and the gritty environs of the Townhouse in West London (renowned for its acoustical suitability form percussive instruments) echo Mercury’s own love for seclusion and bursts of social largesse. Of course one cannot overlook the 1972 project that Fred undertook as the mythical glam rock beast Larry Lurex where he collaborated with Robin Cable at Trident Studios in 1972. Sessions included versions of the Barry/Greenwich/Spector epic “I Can Hear Music” and Goffin and King’s elegiac “Goin’ Back”. Brian May and Roger Taylor were enlisted and Mercury devoted just as much attention to these cuts as anything else he ever did. He was, after all, a consummate professional and an old-school entertainer with as keen a pop ear as anyone in British musical history. If you can pick up the original singles, so much the better though you will find pristine takes on The Solo Collection and Lover of Life, Singer of Songs. The former is a lavish twelve strong CD/DVD box set that includes interviews, killer rarities like a 1969 Ibex version of The Beatles’ “Rain” and detailed breakdown material, singles, club mixes, B-sides et al. The whole kit and caboodle. Lover of Life… is another handy précis, subtitled The Very Best of Freddie Mercury Solo – whose cover depicts the artist in Matador style. Then we have The Freddie Mercury Album, a huge seller from 1992 released to coincide with the first anniversary of the great man’s passing; also the Barcelona: Special Edition from 2012. Consider the leap between 1984’s “Love Kills”, featured in Metropolis: The Original Motion Picture Soundtrack to the darker atmospherics of the Montserrat partnership. Here is Mercury moving across boundaries and cultures, a truly modern artist. In life and in death Fred touched millions with his stage presence and his inclusive vocal style, one that managed to take no prisoners while giving off warmth and intimacy. He was indeed rhapsodic with talent and energy to burn. He died far too early in London, in 1991 aged just 45 but he left behind a true legacy that doesn’t ever diminish.